Kristin is a life-saver! I just love my niece! She's only 24, has a great job at NASA, lives on her own and is very independent. Oh, and she's adorable too....I want to be like her when I grow up! A special shout-out to Kristin for helping me in what seems the never ending journey of transforming the "craft room" into a studio. Kristin hard at work priming the walls. Not sure if I mentioned before that this room was supposed to be an attic. 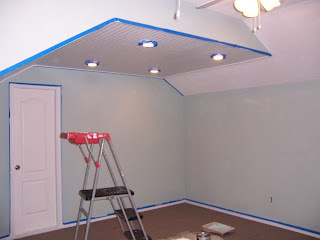 We decided at the last minute before the house was built 8 years ago that I should have a room dedicated to my crafts....I won't tell you what my husband calls it, I've cleaned it up a bit for blog purposes. That's why we have the funny roof lines, etc. 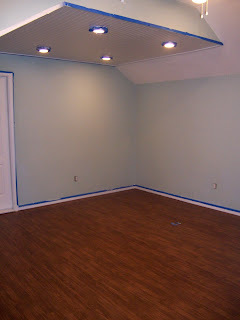 Almost done with painting and ready for the floor! Ta-daaaaah! We have a floor! 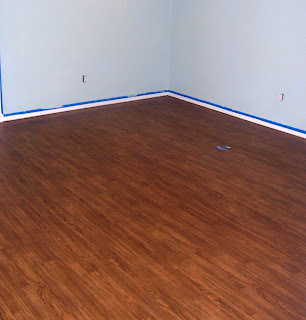 Love the floor.....can you believe it's vinyl? They have come a long way! Enjoy! God bless you and your brushes!